The JTS and I finally made that headboard bench. Once I cleaned out the workshop we had room to spread stuff out and put the bench together. I have all the details for you and a photo of the finished bench is at the end of the post. It’s all done except for the painting. 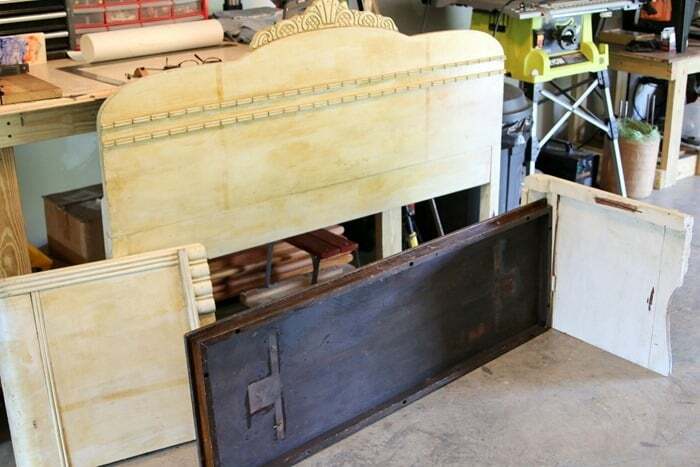 This is the vintage headboard and footboard I bought at my favorite junk shop. I don’t remember how much I paid for it but it was probably around $20-$30. 1. 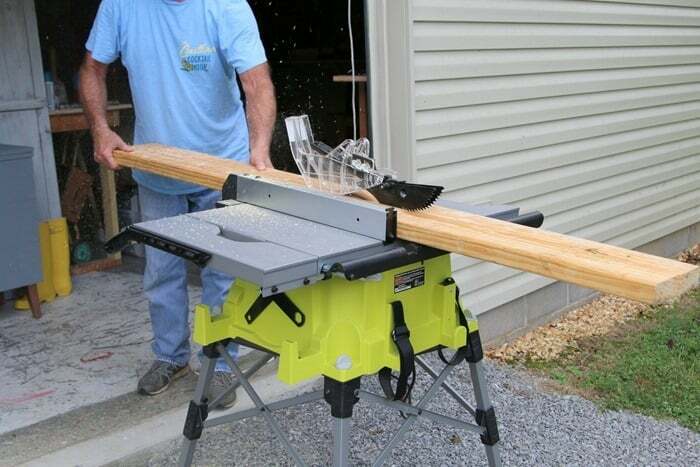 Cut the footboard to make the sides of the bench. We measured the footboard so the sides of the bench would be 18” deep. 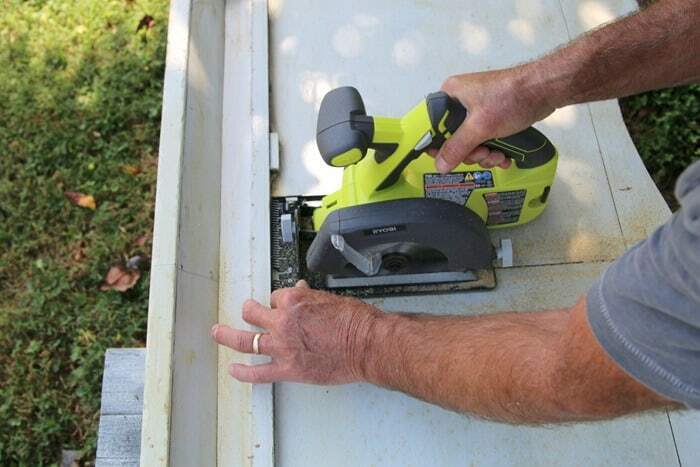 Then we cut the footboard using a circular saw (cordless Ryobi). We cut out the middle of the bench and used the two ends for the bench sides. 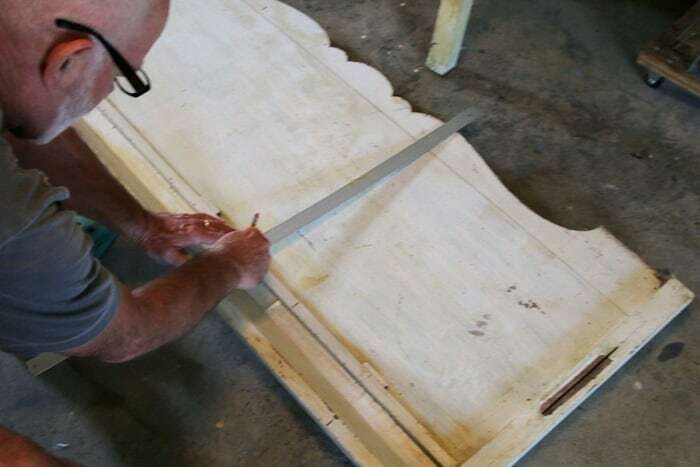 We cut the footboard with it laying on it’s front side but had to flip it over to cut the curved detail. 2. Cut the bottom of the footboard to the preferred seat height. We decided the seat height was going to be too high and we cut a bit off of the bottom of each side/bench end. We placed the pieces of the bench-to-be together just to see what it looked like and decided the headboard/bench back was too tall. It looked a little out of proportion so we cut 2 inches off of the headboard legs. 3. Cut to size reclaimed wood top or new wood for bench seat. 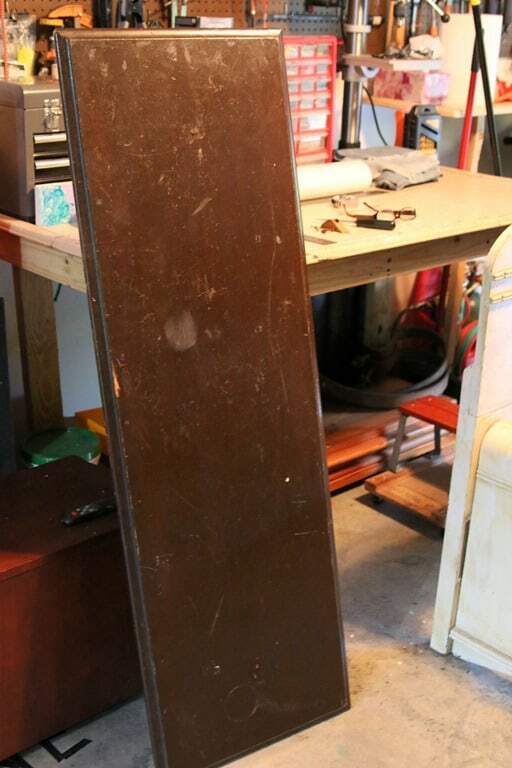 I found a reclaimed sofa table top in my junk stash. We could have used new wood to make the bench seat but I liked the look of the reclaimed top and it was the perfect length. A match made in Heaven. Or so I thought. More on that later. We left the small apron on the underneath side of the top. The only cutting we did was to rip one long side down to the apron. 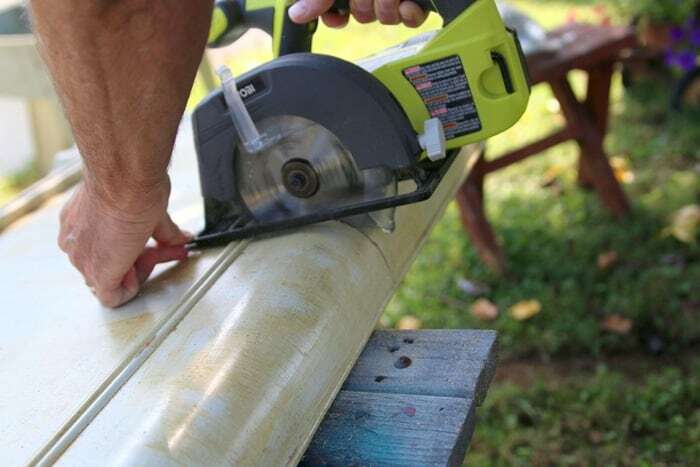 Meaning we basically cut the decorative edge of the wood off of the long length of one side. 4. 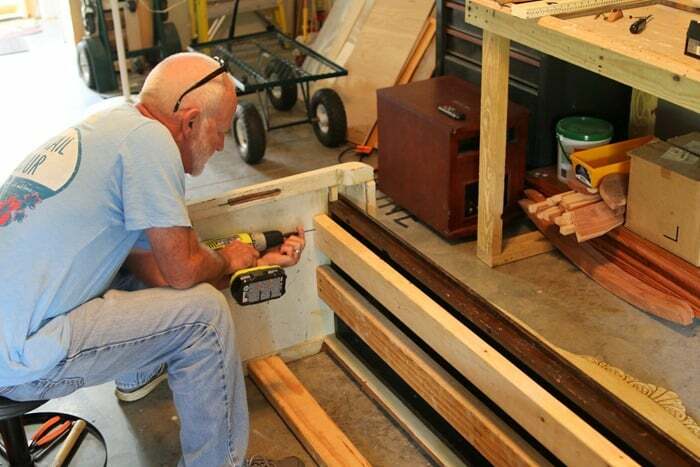 Attach the bench seat to the bench sides. To attach the seat to the sides we set the seat on the inside lip of each bench end. We used a brad nailer to hold the seat to the sides for temporary attachment. 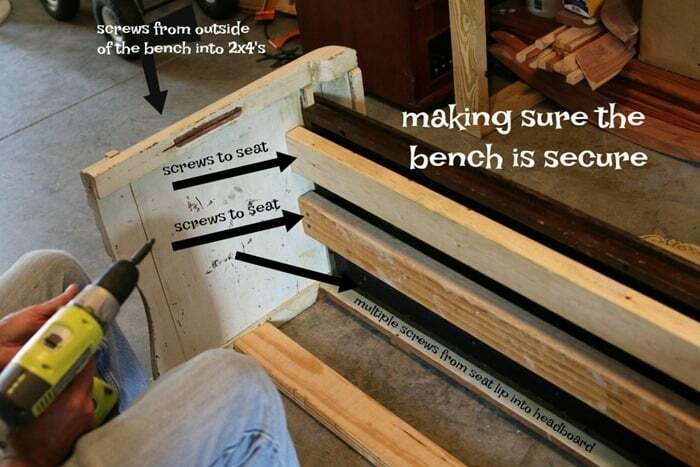 This made it much easier to put all the pieces together before using screws to make the bench sturdy and secure. The JTS (aka Junktion Technical Specialist, aka hubby) used really long screws to attach the headboard to the sides of the bench. He drilled from the backside of the headboard into the end of the bench side/arm. 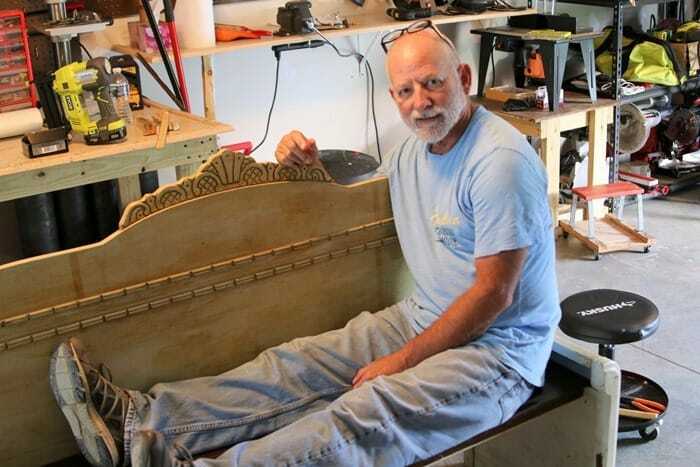 To assure the bench was sturdy we added a wood brace between the legs of the headboard. We used a 2×6 found in the wood stash and ripped it down the middle. For added seat support we used the other half of the 2×6 under the seat along with a 2×4. The wood seat supports were attached to the bench sides and the reclaimed bench seat. 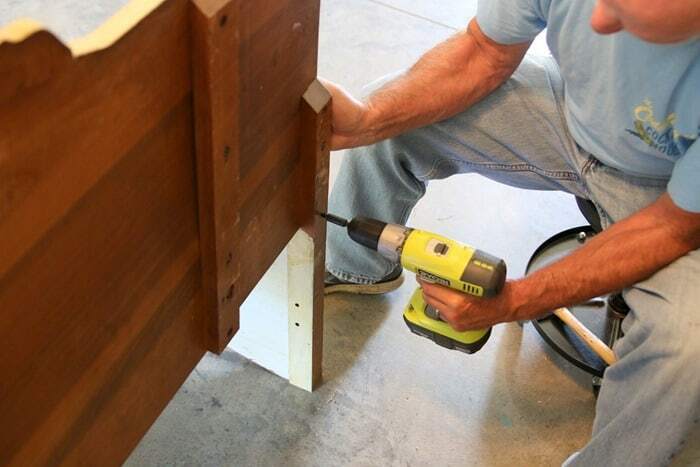 The back lip of the seat was attached to the headboard along the whole length of the seat using screws. We did extra work to make sure the bench would be sturdy and secure. We wouldn’t want it to fall in!! The JTS volunteered to try it out. I think he just needed a rest. It took us several hours over a period of 4 or 5 days to put the bench together. We needed a timeout one day because we were having issues. We know when to stop for the day before things get too heated, lol. Do you and your significant other do this too? Seriously, we probably made the headboard bench the hard way. I have the vision for the projects but sometimes the vision turns out to be a nightmare. Using the reclaimed sofa table top was where I went wrong. It would have been easier to make a support for the seat and then use plywood as the seat (like my friend Marie did here). Live and learn. Next time….and there will be a next time….well, we have a little experience in headboard bench building now. Time to paint the bench but not sure what color. 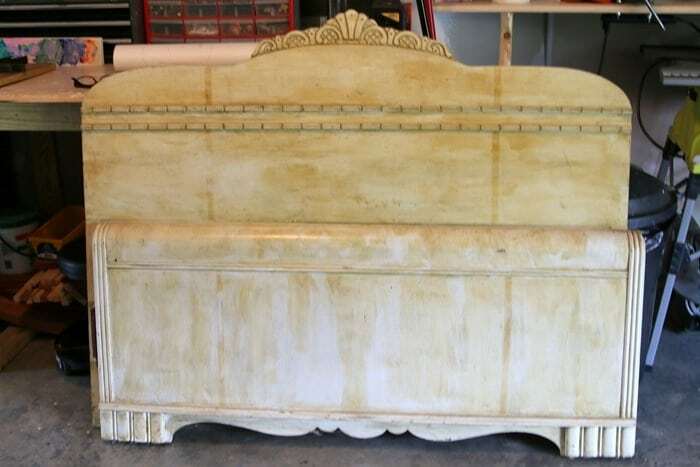 It’s finally painted and you can see it here….The Color I Painted The Headboard Bench. No plans to paint the seat. That was the whole reason for using the reclaimed piece. Leave it as is, except for cleaning and refreshing. What do you guys think? Like it? Leave a comment please with paint ideas. See you tomorrow. Love it!! And how lucky are you to have your very own JTS. My husband is very understanding and great about my collecting and painting. But he draws the line at helping 🙂 can’t wait to see an awesome Kathy paint job and some pillows on it. Well, I love it. As to the height, I guess it depends on where it is to go. Don’t paint the seat, just clean and wax. Cream or grey would be nice. Neutral, especially if you plan to sell it. I agree, it needs something in front to cover the extra wood. Well done, can’t wait to see the finished piece. Keep it simple to show off the inlay strip but have fun w a cushion! Very creative. You did a good job. The detail on the top of the back of the bench is really nice. Maybe bring it out with some waxing after painting is done. Love this bench, the height is perfect as it is! I would paint it either a pale celadon blue or a pale seafoam green, something that works as a neutral but has a little more interest than the usual white or cream. Whatever you choose I’m sure it will be perfect! Think I would make a cushion with cool fabric and get paint colors from that. Maybe french provincial. Paint headboard light gray with off white stripes and use bold check in black and white or soft blues. Nice work. Well…I , too, like the height of the back. 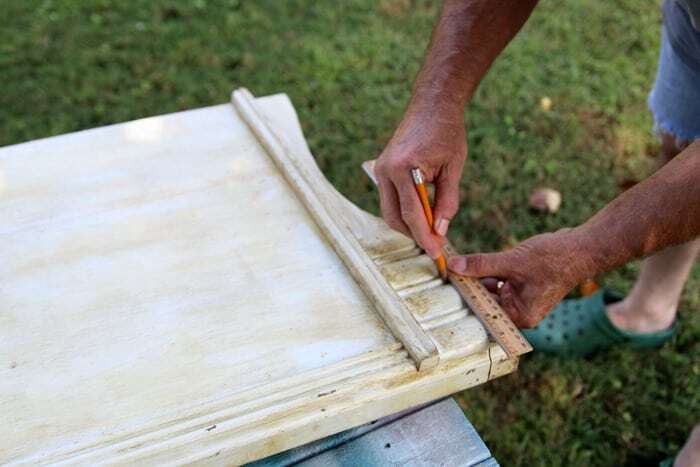 After painting, the back brace will blend in, however, I also suggest a thin trim moulding piece to cover the rough wood across the bench under the seat. That dark seat will look great with off-white or cream, but that shade looks super nice with soft green too. 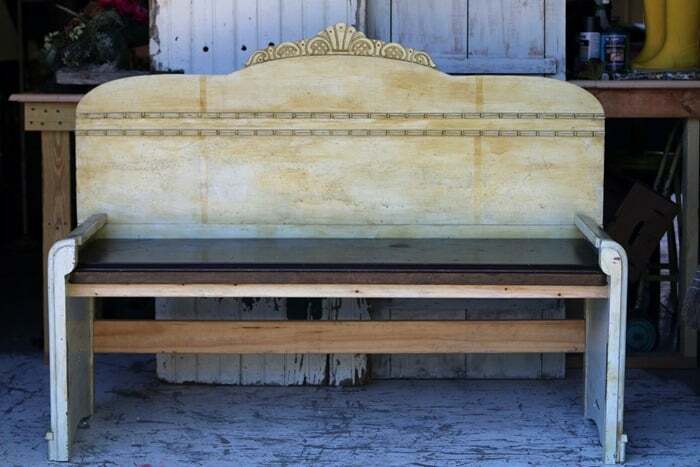 Keep the painting simple and let the style of the bench make its own statement. Those “arms” couldn’t have worked out any better, they really add some style. 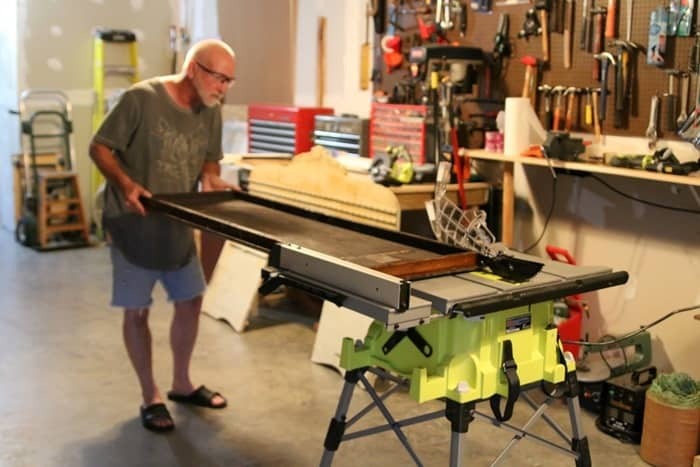 And…yes, projects with both my hubby and I can most often get testy! lol. Can’t wait to see it all done. You should be proud of all your beautiful projects. I think it’s perfect ! Just needs a paint job ! I see bed benches all the time on Pinterest. They’re great. I have to say, I remember your friends bench and it is my favorite of them all. Super simple and just awesome. I think yours has that wonderful simple shape and I can see that it will also be unique. You might want to place a flat board just under the front of the seat to cover the different woods. I believe an off white with some dark distressing to bring out the details would look really good, like Barbara said. Also, the back brace is obtrusive, so maybe you could move it up so it wouldn’t show? It turned out awesome! Based on your TS sitting in it, I wouldn’t cut the back down. It looks like the perfect height to me. If it were me, I’m thinking white paint with a little distressing. Can’t wait to see what YOU do with it. 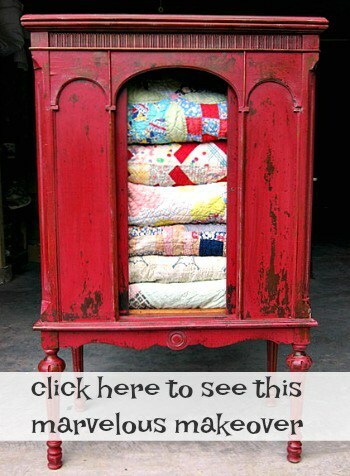 I LIKE THE IDEA OF A LIGHTER CHALK PAINT WITH SOME DARK WAX TO BRING OUT THE DETAILS . GREAT IDEA. 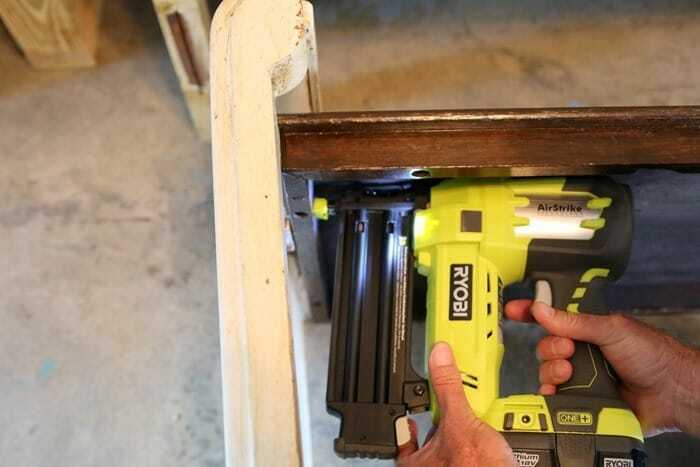 YOU HUSBAND SURE HAS THE POWER TOOLS AND THE KNOW HOW. I really really like. I like that you turned the sides so the finished side was out. I guess if I was painting it I would pick a lighter color so the details of the wood embellishment would be highlighted. Maybe a blue, that seems to go with a lot of decor. Are you keeping this or selling? I think it turned out great. Amazing job. 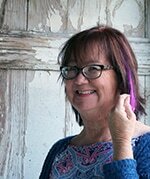 Kathy, the back brace underneath seems obtrusive. I would suggest enclosing the underside for storage, either with some magazine shelves or possibly with some shutter doors. Otherwise, looks great! Why was it wrong to use the table top? I like the dark wood. I think it turned out great, a hand painted mural on the back would look awesome. Love it! I like the height of the back as it is. Just looking at the picture, back could be cut down more. Sorry, just my perspective. Yes, I think we should have cut it down just a bit more Nancy. Thanks for your comment. I love it, but it sounds very difficult to build. I look forward to how you decide to paint it.